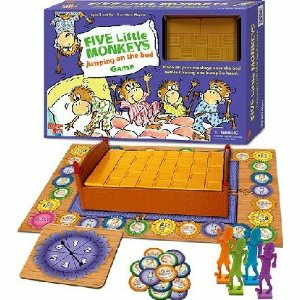 Inspired by the best-selling children's book by Eileen Christelow, Five Little Monkeys Jumping on the Bed is a simple-to-learn game that introduces children to counting and strategy while developing fine motor skills. The object of the game is to get all of your monkeys onto the bed. Sounds easy, right? Well watch out, because your monkeys may jump off the bed at any time. And when they do, its time to start over. Game includes game board, plastic bed, 24 monkeys, 20 punch-out tokens, spinner card with spinner and instructions.